Lauren did an amazing job writing up exactly what we got in our swag bags, so I won't rehash that, but for SEO's sake I would like to thank the following manufacturers for their donations. It was so cool to actually get a swag bag! But at Dover, I made a couple of purchases: white waxed thread for Connor braids, a $0.99 seam ripper to replace the one I broke last season (oops...), and a rubber brush for removing dog and horse hair from textiles. Big spender! I tried really hard to buy a Dressage pad...to go with the Dressage saddle I unexpectedly came home with (going to keep you in suspense on that one for now)...but sadly after 20 minutes of three of us trying to find a pad that didn't look enormous on a 16.5" saddle, we failed. 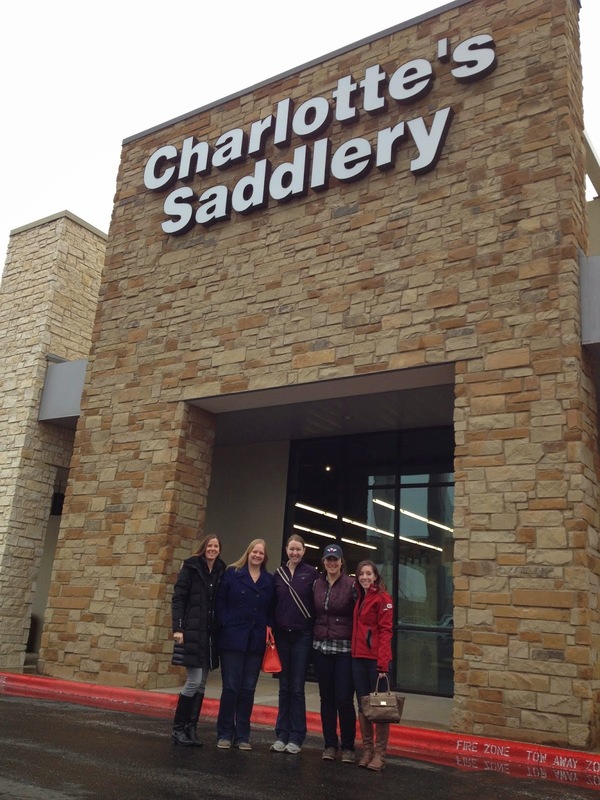 It was a lot of fun to go actual shopping in an actual tack store with actual horse friends! I highly recommend the Horze pony sized Dressage saddle pads for small dressage saddles! They are reasonably priced and come in all kinds of fun colors plus they don't look ginormous! Maybe I will just have to look into getting one with the gift certificate we got last weekend! Oooh, bad Tori for enabling! Haha. I shopped for my pony all weekend too! Love it! It's the best kind of shopping. You can sometimes use a straighter-cut ap pad. I have one that might work. I'll send you measurements and if it's right, it's yours for the cost of shipping. I actually did end up with one thanks to Jen, it's too small for Paddy, but thank you for the offer! I do this all the time. I get all big eyed at Rolex and tack stores and end up buying braiding supplies. It's a problem. So sad about the saddle pad debacle! I know, but it was so much fun shopping with you guys anyway. Like a scavenger hunt, just without the whole finding the thing at the end. Haha. I got some from smart pak that fit my 17 inch saddle and don't look like a bedsheet on Harley. I'll have to look into that, now that C is on a Smartpak, they are cheaper. That's a whole other blog post. Tomorrow for the Dressage saddle! Ooh fun shopping (esp bc I get unreasonably giddy about the little "boring" everyday stuff lol). Can't wait to hear about the saddle! The boring stuff is fun too! Saddle is coming tomorrow! Yay saddle!! I have a 17" dressage saddle and the only pads that ever fit really well are the Toklat Classics pads. Oh, that is good to know. I love Toklat AP pads, and I say that having never owned one myself, just borrowed ones off the pile at the barn. They are practically indestructible and always lay so nicely. Thanks for the tip! Still, had to comment to sat weekend sounds fab! Would love a chance to go to a blogger meet up sometime! Big spendah indeed! The Stubben saddle pads run tiny for some reason, but I've only had their AP pads not dressage.